I don't know what was with the 90's and bright colors but looking back on it all now, I can see that nobody had any sense of color and yet I'm gripped with so much nostalgia for the era. Another hallmark of this decade was Nintendo's N64, which also got on the neon bandwagon with all of it's "Funtastic" colors. Beautiful, isn't it all just so beautiful? No? Well, forget you. I'm here to talk about some of the rarest N64 controllers out there, the Foxdata Ltd. controllers. The British-based company started taking out full-page ads in the summer '97 offering chrome N64 consoles and controllers. They even offered to chrome your system if you mailed it in. 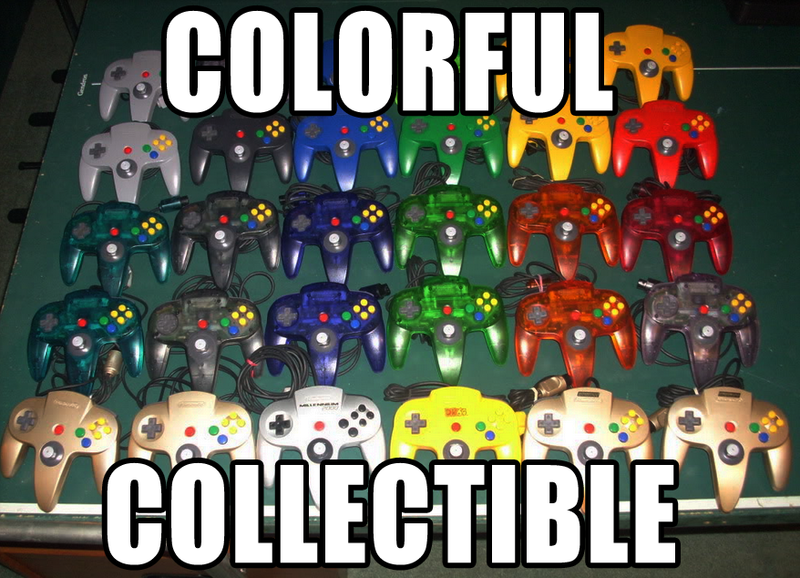 The colors offered for these controllers were Chrome, Copper, Gold, and Electric Blue. I have never in my entire life seen either the chromed N64 or any of these painted controllers come up for sale on eBay or anywhere else. I have never even seen any pictures of these items except for in these advertisements. If you have any more data, please leave a message in the comments. What I have seen are Foxdata's second round of radical paint jobs. Released for the following Christmas season, Foxdata offered up for sale four of the gnarliest custom N64 controllers to date. Moving from the top-right clockwise we have: Red Rain, Chrome Leopard, Purple Rain, and Desert Storm. All were sweet paint jobs applied to stock blue N64 controllers, except Desert Storm which was made from yellow controllers. Their controllers were even sold in some stores but to say they are "official" would be misleading. They are just really mondo items of extremely high quality and are still sought after by N64 collectors even today. They usually sell for around $300 a piece but I have seen them sell for as little as $150. There are rumored to have only been around 500 of each type made. In recent years, I have seen N64 controller collecting boom and for good reason. There are so many different colors and a lot have a really unique and interesting story behind them. A lot of the special ones come from Japan but the US has it's fair share of exclusives. I personally think they are really beautiful and I know a few collectors who wall mount them as art but I, personally, find it hard to justify spending hundreds of dollars on controllers but I can still see the appeal. It's like a rainbow had babies. I've had the Desert Storm one once. Sold on eBay (for about $30) to ddr2nite - probably one of the biggest collectors of Foxdata controllers. See his pics @ http://s9.zetaboards.com/Nintendo_64_Forever/topic/7294576/1/ and http://s9.zetaboards.com/Nintendo_64_Forever/topic/7372363/1/ . As for the quality - it's very good. They package them back in the original boxes, with a small white sticker with the colour name on (eg. Desert Storm), and the paintwork is about perfect. Made me think it was actually an original Nintendo released item before I was informed of my own stupidity. Don't feel bad. I once thought Mad Catz controllers were official products. Only took two weeks to figure it out.